User story is one of the very important component for users who capture requirements with Visual Paradigm. Each user story features a set of properties for you to describe the different aspect of a user problem or requirement. A property is called scenario. Each scenario involves a set of steps, recording the preferred system behavior in accomplishing that specific user story. By default Doc. Composer comes with a Details template that can output the properties of a user story, which include also the scenario of user story. It works pretty well but sometimes, you may want to do some customization for the output. In that case you may need to write your own template in outputting user stories’ scenario. In this article we will show you how to output the scenarios of a user story. We need a sample project to show you how the sample code works. The sample project bundled with Visual Paradigm is a good choice. Please follow the steps below to create a template with the sample code. An explanation of code will be given in the next section. Select Window > Start Page from the application toolbar. Click on Learn more for Sample Projects. 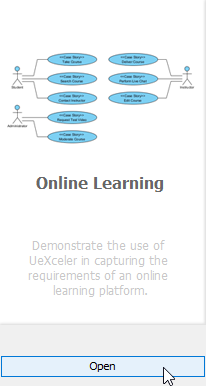 Click on Open below Online Learning. Open Doc. Composer by selecting Tools > Doc. Composer from the application toolbar. 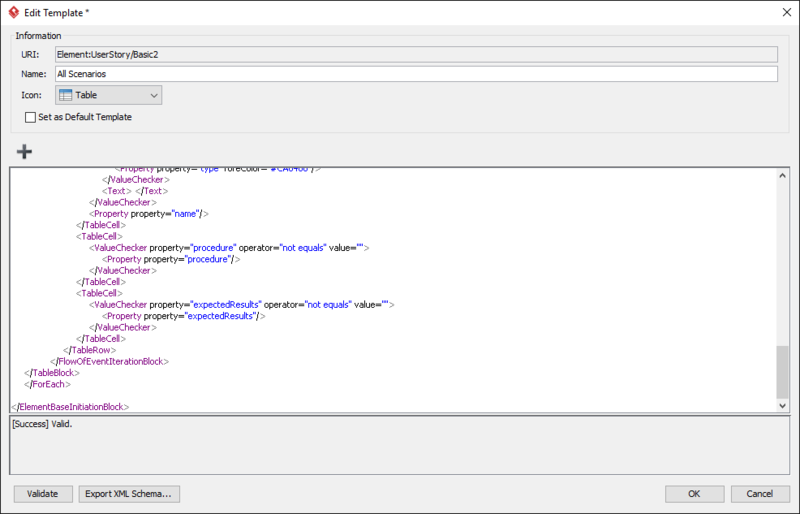 Open Model Explorer and select any user story. 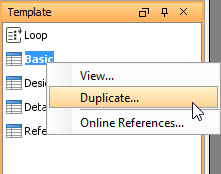 Right click on any template listed in the Template pane and select Duplicate… from the popup menu. In the Edit Template window, enter All Scenarios as the name of template. 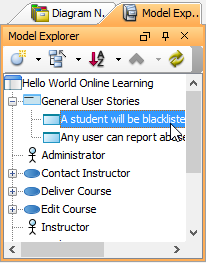 In Model Explorer, look for the user story An instructor can create new course under the use case Deliver Course. 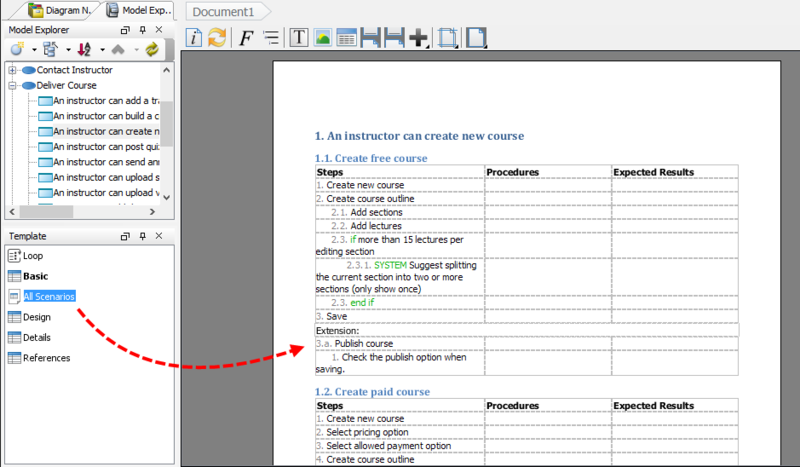 Then, drag the template All Scenarios from the Template pane onto the document. You should see two sets of scenarios, which looks like the one below. The template can be divided into two main parts. The first part involves a loop that loop through all the scenarios of a user story. For each scenario, form a table that contains the steps of scenario as well as the steps written in the extensions section (if any). This is responsible for retrieving all scenarios of a user story. The value of property is scenario. The steps of a scenario can be retrieved by using . Steps in main flow and extended flow (written in the Extension section) can be optionally included or extended by specifying true/false for @includeSteps and/or @includeExtension. We will talk more about this below. You can use to add an indentation to the document, for represented nested steps. The level of indentation is controlled by Doc. Composer engine. The deeper the level, the more level of indentation. You might have used controls like if, SYSTEM, loop, else-if in your step. Those can be retrieved by using a with @property=”type”. In this example we try to apply green as the font color of the word system, if the step is a system response. You may also retrieve the procedures and expected results by using with @property=”procedure” and @property=”expectedResults”, respectively. is used to find out if the querying scenario contains any extension. (table cell) in HTML. You can use @colspan to specify the number of additional column to be ‘occupied’ by this cell, within the row. You can compare this with the one used earlier. For this one, we excluded those steps in the main flow by specifying @includeSteps=”false” (The ‘Steps’ here means steps in main flow) and included the steps in extended flow by specifying @includeExtensions=”true”.